Collect Employee Time with devices designed for Frontline Time and Attendance. Ranging from tested and proven “make your own” kiosk supplies to “plug and play” Timeclocks, Touchpoint gives you the best solution for your budget and your efficiency requirements. Choose the hardware strategy that works for you with proven DIY components or professional, plug-and-play Timeclocks. Our Timeclocks come with built-in support packages to reduce maintenance, so you’ll know total cost of ownership and avoid surprise hardware costs. Touchpoint was spun out of Frontline, making us the most trusted specialist in smooth integration with thoroughly tested and approved devices that meet and exceed Frontline requirements. 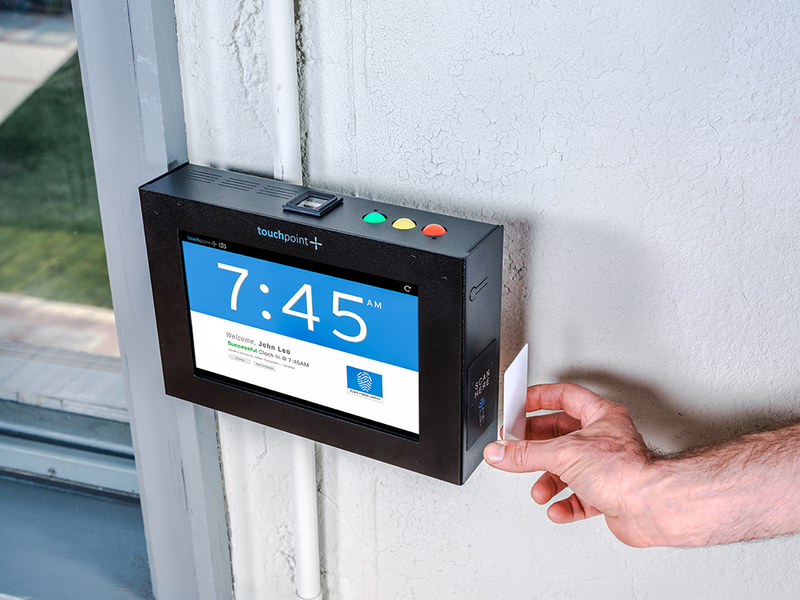 Frontline Time and Attendance and your employee ID system. Ready out of the box. We pre-configure, pre-integrate, and test all units beforehand so they are ready to work upon arrival. Guaranteed integration the first time. Save the time and energy that IT would spend researching and assessing solutions by using our tested and proven supplies. Increase User Adoption. Provide a secure, professional, Frontline-optimized user experience to reduce time collection hurdles and improve system adoption. Optimize data collection process by simplifying installation to where users will use the most frequently and integrating existing tech and badges. Reduce manual corrections. Enhance your system by utilizing industrial grade hardware that eliminates the need to edit timesheets due to device bugs, breakdowns and failures. Minimize IT support tickets. Our experienced team of tech specialists are always on standby to manage updates and troubleshoot by remoting in from any location. Avoid frequent maintenance with industrial hardware rated for 24/7 use for 26,000 hrs (over 4x the 6,000-hr average lifespan of standard consumer devices!). If there IS a need for maintenance, Touchpoint’s easy “swap out and replace” program makes sure you have a working unit while yours is in the shop.